Factor II (FII) deficiency (also called hypoprothrombinemia or prothrombin deficiency) is a rare coagulation disorder, which can be acquired in some cases. It affects both men and women, as well as people of all races and ethnic origins. Those affected by the condition may experience life-threatening bleeds. However, treatments now exist that make it possible to control bleeds. It is essential that people affected by this deficiency be medically followed in a hemophilia centre. The function of the centre staff is to provide members of the public with the resources needed to diagnose, treat and monitor their condition as part of the delivery of quality care. People affected by this deficiency and those close to them have very little written information about it. This booklet explains the causes of FII deficiency, its symptoms and available treatments. We hope that this information will help answer your questions. FII is an important coagulation protein that makes normal blood coagulation possible. This protein plays a role in the complex coagulation process that prevents loss of blood from damaged blood vessels. As soon as a blood vessel breaks, the components responsible for coagulation come together to form a plug at the break. 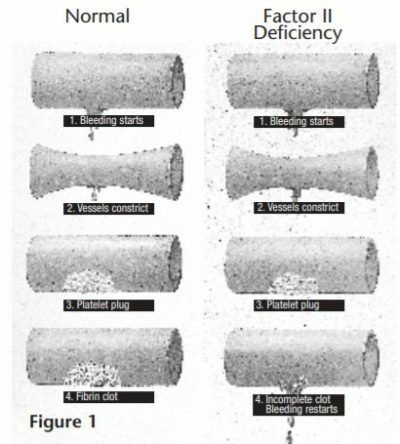 Coagulation factors are required to hold the plug (or homeostatic plug) in place and form a strong, permanent clot that will allow a complete scab to form. Step 1 The blood vessel is damaged. Step 2 The blood vessels contract to restrict the blood flow to the damaged area. together at the site of the damage in order to form a plug, the homeostatic plug. This process, which helps stop bleeding, is called platelet aggregation. surface of the platelets to form a fibrin clot which looks something like a mesh. This permanent clot is what finally stops the bleeding. 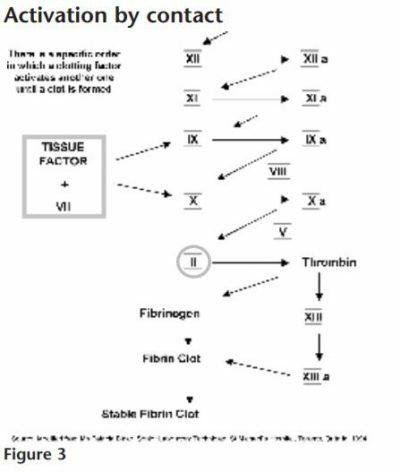 These coagulation factors, (factors I, II, V, VII, VIII, IX, X, XI, XII, XIII and von Willebrand factor), are triggered in a kind of domino effect, called the coagulation cascade reaction. The role of FII in this cascade reaction comes when FII (prothrombin) is converted to thrombin. This conversion is initiated by FXa.Without prothrombin the process would stop. There are two types of FII deficiency. First, it is possible to have a lower than normal FII blood level. Second, it is also possible to have a normal level of FII, though it does not function properly. Congenital FII deficiency is really very rare, as only 100 cases are known worldwide. It affects both men and women, as well as people of all races and ethnic origins. 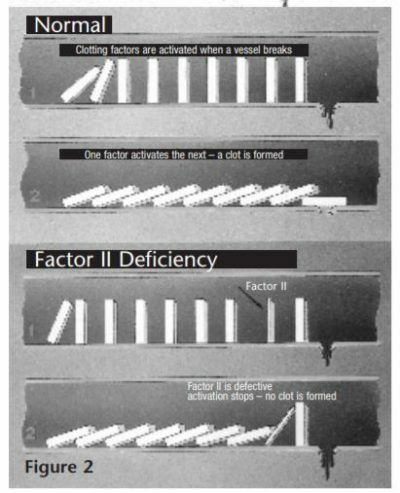 Note: There is another form of factor II deficiency that is not inherited at birth but is acquired. There are various causes. A vitamin K deficiency caused by antibiotics and intestinal disorders (that prevent absorption), can cause a temporary FII deficiency. Newborns may be born with a vitamin K deficiency. Liver disorders can also cause a reduction of FII, since this organ synthesizes FII. Lastly, drugs such as Coumadin®, interfere with the function of factor II. This diagram illustrates the influence of FII on other proteins when coagulation is activated to stop bleeding. Note that this protein reacts and acts at several points in this cascade to ensure the clot is stable and solid when formed. 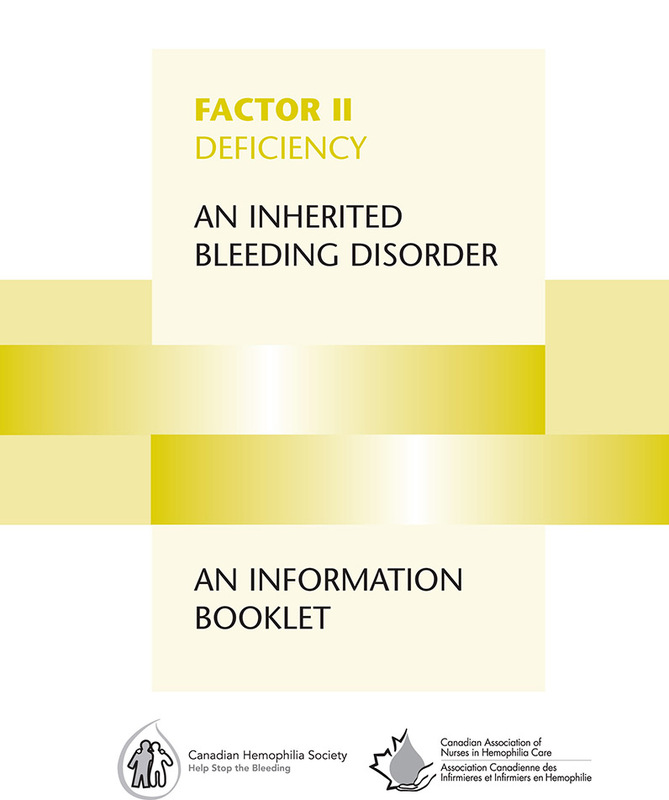 How is factor II deficiency inherited? FII deficiency is an autosomal recessive inherited disorder, which means that both parents must be carriers of the defective gene in order for a child to have the disorder. A carrier is someone who has inherited a single defective gene from his or her parents, without being affected by the bleeding disorder. Carriers are sometimes observed with an FII level barely lower than normal. What are the symptoms of factor II deficiency? The symptoms are different for each individual. However, the lower the level (see the table below), the more frequently the symptoms will appear. Other bleeding may be observed, and it is necessary to recognize the signs and symptoms. It is strongly recommended that people who suffer from FII deficiency learn to recognize the signs and symptoms of bleeding, which can threaten their lives or cause serious physical problems. People with a light to moderate FII deficiency should pay special attention to these signs and symptoms. Such people often show little concern, since their symptoms are fairly rare. This false impression could place them in difficult situations, since they cannot recognize a major bleed and therefore will not be able to react adequately and in a reasonable time. What should be done in the event of a bleed? When someone with a bleeding disorder senses a bleed, it is important to contact the hemophilia centre during opening hours, or otherwise the on-call nurse and/or hematologist. Given the rare nature of FII deficiency, it is strongly recommended that sufferers contact their hemophilia centre as soon as possible, so that they can establish and/or suggest a treatment plan to the emergency staff or staff in another institution. It is also strongly recommended that they bring with them all documents they have in their possession that can explain the condition and the appropriate treatment. If an initial dose of coagulation factor is on hand, do not leave it at home. Measures like this will make the assessment and treatment in the emergency room go much more smoothly. Two treatments are currently available: The first is a prothrombin complex concentrate that contains prothrombin (FII) and factors VII, IX and X; the second is fresh frozen plasma. These two treatments are blood derivatives that are administered intravenously. 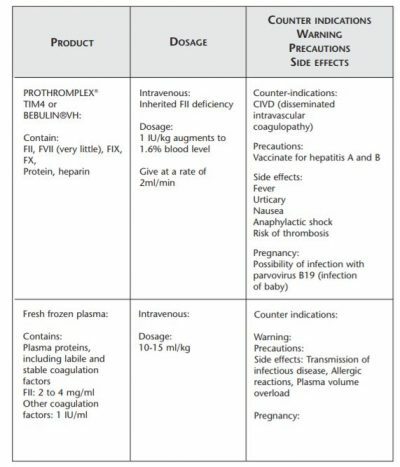 The following table lists the different products used, suggested dose, counter-indications, recommendations for pregnancy, and lastly, a few warnings. As in the case of anyone with a rare bleeding disorder, treatment in the home is a possibility.With instruction available at all hemophilia centres, patients can administer full care at home. It is impossible to make general recommendations on this aspect of care, given that the condition is so rare. However, it is important that the affected individual discuss this possibility with his or her care team. What tests are done to diagnose factor II deficiency? The test requires a blood sample that can be taken during a visit to the hemophilia centre. The blood sample is sent to a laboratory for analysis. Factor II deficiency results in a longer prothrombin time (INR). If the physician notes a long prothrombin time, he or she will order tests for levels of factor II, V, VII and X proteins. The physician will make a diagnosis based on a low Factor II activity. The recommendations for healthy living are the same as for anyone without a coagulation factor deficiency. Follow a regular program of physical activity suited to lifestyle and capability. Maintaining adequate muscle mass can reduce the risk of bleeds. Use high quality sports equipment appropriate for any sport (helmet, elbow pads, kneepads, proper shoes, etc.). The most often recommended sports are swimming and cycling. Eat a well-balanced diet; maintain normal weight. It is important to mention that contact sports like boxing, football, and hockey should be avoided due to the risk of serious injury. Never take aspirin or anti-inflammatories. These increase the risk of bleeding by inhibiting platelet function, which increases the time it takes to form a clot. Some centres keep a list of suggested medications; ask if the centre has one. Patients are also advised to consult their hemophilia centre before taking any herbal medicinal supplements or vitamins and/or so-called natural products sold over the counter. Take care of teeth and see the dentist regularly in order to avoid having drastic dental care as far as possible. The hemophilia centre can recommend dentists who are familiar with coagulation disorders. If surgery, dental work or any other procedure requiring a laceration or cut with an instrument is necessary, contact the hemophilia centre to obtain adequate preventive treatment. Patients should always have the FactorFirst card they were given by the staff at the hemophilia centre on their person. It provides quick information to ambulance technicians and/or medical staff about the condition and the treatments required.Many hemophilia centres suggest wearing a MedicAlert® type bracelet so health care staff can make a quick identification. If planning a trip, let the hemophilia centre know. There are hemophilia centres worldwide, and some of the information they can provide might be helpful while travelling. Patients should always stay in touch with their hemophilia treatment centre. The Canadian Paediatric Society publishes regular updates on recommended vaccinations for children.We feel that it is important to follow these recommendations. However, certain precautions should be taken to avoid a bleed at the site of an injection. The nurse at the hemophilia centre can provide information about precautions to take. It is recommended that anyone likely to receive blood derivatives as part of a treatment be vaccinated against hepatitis A and B. This is a simple, effective, available and readily accessible preventive measure. As a result of different viral inactivation procedures, today’s blood derivatives are considered safe. However, one can never be too careful, so this recommendation should not be ignored. The team works closely with other specialists – a surgeon, an orthopedist, a rheumatologist, a dentist, and a geneticist, among others. The purpose of this multidisciplinary team is to ensure the well being of the patient and, in the case of a child, the parents as well.